NIA CHARLESTOWN NEVIS (March 29, 2018) — Premier of Nevis Hon. 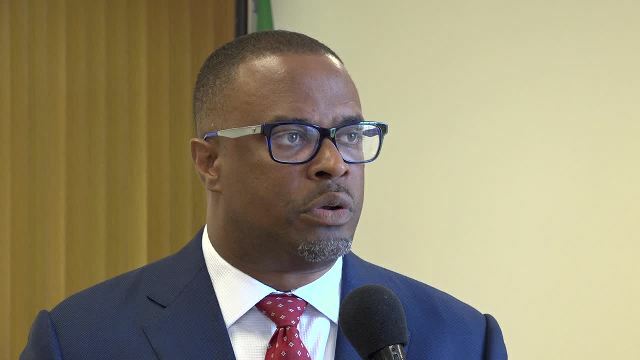 Mark Brantley says he is pleased with the Nevis Island Administration (NIA) achievements under his leadership since taking up office 100 days ago. He promised to continue to keep their commitment to the people of Nevis moving forward. Mr. Brantley was at the time responding to an invited comment from the Department of Information on March 29, 2018, one day after the Administration’s first 100 days. They were sworn into office in late December 2017 following local elections. “So I feel that we are doing the right things in creating the type of environment and the type of ethos for our island that will see all of our people engaged in trying to build Nevis and advance Nevis and if we can achieve that, I think we would have done well,” he said. The Premier, who leads a team of three elected ministers and two senators, stated that so far among the achievements, the 2018 Budget was passed, the Mondo Track sports facility was opened, the Premier’s monthly Press Conference was inaugurated, the process to operationalise the Integrity in Public Life Legislation had commenced, work advancing the geothermal development process, successful Agriculture Open Day and demonstrating Nevis’ commitment to women and girls and the Sustainable Development Goals of 2030 Agenda. He said the Administration had also engaged the Opposition in positive ways and will provide a fully-furnished and staffed office at the Solomon Arcade by April 09, 2018. They have also requested the Opposition’s input in the operationalisation of the Integrity in Public Life Legislation. “We’ve written to the Hon. Joseph Parry inviting him to nominate his member to the Integrity Commission. “I will nominate a member and then, of course, the chairman will be a matter for the Deputy Governor General in her own deliberate judgement,” he said. Mr. Brantley said the public has been very responsive to the Administration’s work so far and he continues to meet with them at his office weekly on a Thursday. “That is unusual because ordinarily people say that politicians hide themselves away…On average I meet with 20 to 24 people every Thursday,” he said. The Premier described his Cabinet as gelling well and used the opportunity to applaud his colleagues for their contributions. “Personally, I feel really good. I feel it’s a good opportunity where we have brought a new vigour and vitality to government. It’s a younger team. It’s a new look team with new members who bring their own perspective, which I think has really enriched and inform what we do in terms of our discussions. “We have a blend of some who were there before, some now coming. As I like to say, ‘We are old enough to know and still young enough to do’ and we have been trying our best to do. So I feel very good. I feel very optimistic,” he said.